Harlequins goalscorers up to the end of extra time: Adam Lawrence, Mark Fears and Lee Hampton. 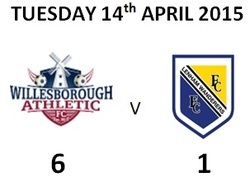 Willesborough started the strongest and took the lead after only 5 minutes when Luke Burden rose unchallenged to a dangerous cross into the penalty area and thumped an unstoppable header past the Lenham goalkeeper. Lenham responded and were only inches away from a spectacular equaliser with a thundering 30 yard shot which was touched onto the crossbar in an equally spectacular save by the opposing keeper and was eventually cleared. Willesborough restored their lead after 20 minutes when Danny Taylor fired a low shot from inside the area past the keeper’s despairing dive into the corner of the net. The second half started very much like the first half with Willesborough scoring a fourth goal after only 5 minutes through Matt Burdon finishing off a flowing move which left the Willesborough player firing the ball into an empty net. The scoring was completed after 30th minutes with Willesborough’s sixth goal from Jason Sims. ﻿ The Weald of Kent Charity Cup Committee members extend a warm welcome to Homelands. The Homelands cafe in the main stand will be open serving cold/hot food and drinks. Charity Donation cheques will be presented to the two nominated charities before kick off – The Kent Air Ambulance Trust and Pilgrims Hospice. The trophies and medals will be presented by Andrew Gidley, the Sports Editor of the KM Newspaper group. We look forward seeing you there. MATCH REPORTS > BORDEN VILLAGE REACH THE SENIOR FINAL FOR THE 3rd YEAR IN SUCCESSION. Congratulations to Borden Village FC and APM Contrast Reserves FC on their victories in the Semi-Final ties played on Saturday 21st march and in particular to Borden Village for reaching the Final for the third year in succession. The village team ,however, were made to fight hard all the way by New Romney who recovered from going behind to a penalty in the first half to come back strongly in the second half scoring a deserved equaliser to level the scores at 1-1 at the end of normal time. 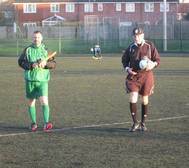 Extra time could still not separate the two teams and the match went to a deciding penalty shoot out. Both teams confidently converted their first 3 penalties . New Romney’s 4th penalty however, although sending the Borden keeper the wrong way, went narrowly wide of the opposite post and Borden took full advantage by scoring their 5th spot kick to win through to the Cup Final for the third season in succession. The other semi-final between APM Contrast Reserves and Tenterden Town was an equally close match with nothing to separate the two teams and the scoreline remaining goalless after the passage of 90 minutes but with extra time looming a decisive winning goal was scored by Sean Hardy in added time to send the Maidstone team through to Good Friday’s Final. All Round 1 ties in both Junior and senior sections have now been played. Two more Junior section ties are fixed for 6th and 13th December and once played 3 out of the 4 Round 2 ties (quarter-finals) in both the Junior and Senior sections will then have been completed. Faversham Harlerquins 4 (goalscorers Lee Hampton. Mark Scott, Sam Gaiger and Adrian Jolly. New Romney Res goal scorers: Aurin Johnson x 3, Shannon Hodson x 2 and George Bourne. MATCH REPORT> Hat-tricks for players from both teams in a high scoring Junior Section first round tie at Aldington which needed extra time to obtain a result which finished in a narrow victory for New Romney Reserves 6-5 after the teams were tied at 4-4 at the end of 90 minutes. Hat-trick men were Aldington’s Ryan Lymn and New Romney reserve’s Aurin Johnson. Borden Village goalscorers: Ben Taylor, Paul Teague (pen), Steve Goldsmith and George Latham. MATCH REPORT> In a very close, hard fought encounter honours were even at half time with a goalless score line and few goal scoring chances. Kennington took the lead early in the second half when an attack was only partially cleared and Luke Webb latched on to the clearance in the penalty area and slotted the ball into the net. Two goals in the space of 5 minutes towards the end of normal time, one a penalty, appeared to have sealed victory for last season’s Senior Trophy holders but a thumping Kennington free kick from 25 yards in the closing minutes took the tie into extra time. in the first half of extra time Borden’s Steve Goldsmith skipped into the penalty area , evaded a Kennington challenge, turned and chipped the ball accurately over goalkeeper and covering defenders into the net to put the away team back in the lead. A fourth Borden goal 4 minutes into the second half of extra time – a low shot from George Latham which went into the net off a post finally sealed a hard fought victory for the visitors. MATCH REPORT> Three Suttons and Tenterden Town Reserves shared 8 goals in a pulsating Junior Section Round 1 tie at Chart Sutton. Three goals up at half time Three Suttons looked bound for the second round particular when a fourth goal went in around the hour mark. A remarkable fight back in the last half hour, however, saw Tenterden Town Reserves score 4 goals themselves to level the match with two goals scored in the last few minutes of normal time. Extra time resulted in no further goals and Tenterden Town Reserves ultimately won through 5-4 on penalties. Rolvenden goalscorers were Wayne Beaney (2), Tim Sims and Ben Charlesworth with two Lydd own goals. Willesborough Athletic goalscorers were Luke Burdon (4), Tom Collins (3), Josh Jones (2), Matt Boulden and Matt Burden. MATCH NEWS> Willesborough’s defender Mick Doyle sustained a serious leg injury in the first few minutes in clearing a Smarden attack which required hospitalization. The match was delayed for around an hour to allow paramedics to treat Micky’s injury (subsequently confirmed by the club as a clean break of the fibula) but then continued with the agreement of all. We all wish Micky a speedy recovery. Competition is now closed for further entries for the 2014/15 season. The Competitions AGM is on Monday evening 30th June 2014 at Sandyacres Sports and Social Centre in Ashford at 8.00pm. 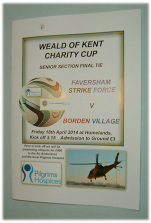 In a hard fought Weald of Kent Charity Cup Final at Homelands on Good Friday Borden Village retained the Senior Trophy they won last year for the first time with a 3-0 victory over fellow Kent County League opponents Faversham Strike Force in their first season in the Competition. An even first half saw Borden Village go in at half time with a narrow advantage when Steve Collar netted after 13 minutes. Faversham Strike Force started the second half brightly and only a tremendous save after 5 minutes by the Borden Village goalkeeper from a header by Faversham’s Sam Reed kept the Borden Village lead in tact. In a contest where both defences remained strong goalscoring chances were limited and the increasing pressure from Borden Village finally reaped rewards when Liam Baxendale restored his team’s lead with a low shot after 65 minutes. The Borden Village victory was virtually assured just 4 minutes later when Man of the Match Sam Brown fired in an unstoppable shot high into the top corner of the Faversham net. 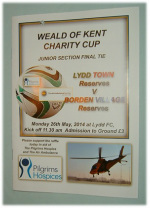 After two consecutive years as losing finalists Lydd Town reserves finally triumphed in determined fashion with an emphatic 5-0 victory in the Weald of Kent Charity Cup Junior Final on Bank Holiday Monday over a Borden Village Reserves side looking to emulate the Club’s first team performance in this season’s Senior Section Final. Lydd went ahead with only 90 seconds on the clock when Joey Tibble rifled a low shot inside the penalty area into the net. Two saves in quick succession by goalkeeper Ben Mackenzie prevented a Borden village equaliser and after 34 minutes Frankie Steer ran on to a through ball to increase Lydd’s lead. Lydd started the second half as they had the first when captain and Man of the Match James Smith fired a loose ball in the penalty area high into the Borden net after only 2 minutes. Borden continued to make a game of it and a strong shot was tipped over the bar by the Lydd goalkeeper. Increasing pressure by Lydd , however, resulted in a fourth goal and a second for Joey Tibble when the forward ran on to a through ball, adroitly lifted the ball over the advancing keeper and ran the ball into an empty net. The convincing Lydd victory was secured three minutes from the final whistle when Joey Tibble unselfishly fed the ball to Darren Warne who gave the keeper no chance with a low shot. We hope this website will be of interest to users. We accept no liability and offer no warranties in relation to it and its content, to the fullest extent such liability can be excluded by law. The material contained in this website is provided for general information purposes. All images and contents on this site are copyright and must not be copied or reproduced without permission. These website pages may contain technical accuracies and typographical errors.